Rock On The Range, America’s premier hard rock festival, returns to central Ohio’s Columbus Crew Stadium May 15, 16 and 17, 2015 for its ninth year with a stellar lineup of top rock bands led by multiplatinum band Linkin Park, global rock juggernauts Slipknot and heavy metal legends Judas Priest–who are currently celebrating their 40th Anniversary. The full weekend of non-stop rock will also feature performances from Godsmack, Marilyn Manson, Breaking Benjamin, Rise Against, Volbeat, Slash featuring Myles Kennedy and The Conspirators, Papa Roach, Halestorm, Of Mice & Men, Anthrax and many more of the world’s most exciting bands on three stages over three days, plus the biggest Rock n’ Roll comedians in the ROTR Comedy Tent. Rock On The Range–part of the World’s Loudest Month festival series–has sold out in advance for two years in a row, with 120,000 concertgoers on hand in 2014. In 2015, ROTR will welcome live music’s top cable channel, AXS TV, to film the weekend as part of their live festival coverage, allowing fans around the world to experience Rock On The Range. To kick off the ROTR weekend with a laugh, Guitar World & Revolver’s Roast On The Range returns to Columbus, Ohio Thursday, May 14. Look for more details to be announced in early 2015 at www.RoastOnTheRange.com and www.RockOnTheRange.com. The 2014 Roast featured nearly a dozen musicians and comedians who honored and lampooned Slipknot and Stone Sour vocalist Corey Taylor in front of a live audience. The current band lineup for Rock On The Range–fueled by Monster Energy Drink–is as follows: Linkin Park, Slipknot, Judas Priest, Godsmack, Marilyn Manson, Breaking Benjamin, Rise Against, Volbeat, Slash featuring Myles Kennedy and The Conspirators, Papa Roach, Halestorm, Of Mice & Men, Ministry, Anthrax, Tech N9ne, In This Moment, Hollywood Undead, Live, Scott Weiland and the Wildabouts, Yelawolf, In Flames, Motionless In White, Saxon, Rival Sons, Falling In Reverse, Apocalyptica, Hatebreed, Periphery, Nonpoint, Baby Metal, The Devil Wears Prada, Dillinger Escape Plan, We Are Harlot, Starset, New Medicine, Beartooth, You Me At Six, Young Guns, Dorothy, Crobot, Shaman’s Harvest, Like A Storm, Unlocking The Truth, Islander, Marmozets, Sabatron, Upon A Burning Body, From Ashes To New, Red Son Rising, and Santa Cruz, with more bands and entertainers to be announced soon. “We’re very excited to be back and playing Rock On The Range. It was an honor to be a part of the very first ROTR back in ‘07 and we’re grateful to return to be a part of this amazing rock n roll event,” says Ben Burnley of Breaking Benjamin. 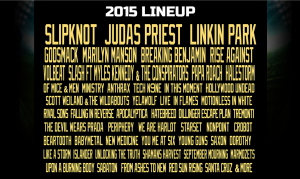 New to Rock On The Range in 2015 will be the Jack Daniel’s Old No. 7 VIP Lounge which features amenities such as dedicated Wi-Fi, charging stations, private restrooms, premium food options and more. This upgrade will be available for all ticket purchases for only $125 while supplies last. For full details about all tickets, including Military Ticket discounts, VIP Packages, Hotel and Ticket Bundles, Camping Packages and Layaway Tickets, visit: www.RockOnTheRange.com. Rock On The Range is proud to once again be fueled by their partners at Monster Energy Drink. Additional sponsors include Jack Daniel’s, Jägermeister, Crazy Dave’s Music Experience and Zippo, with more to be announced. Rock On The Range is produced by Danny Wimmer Presents, AEG Live, Crew Stadium, and RockHouse Presents. The multi-stage music and lifestyle event features a potent lineup of bands on three stages over three days. The nationally renowned festival that’s centrally located in the heart of the country is proud to be part of the World’s Loudest Month festival series, and annually draws huge weekend crowds since its inception in 2007, including a sold-out crowd of over 120,000 fans in 2014. 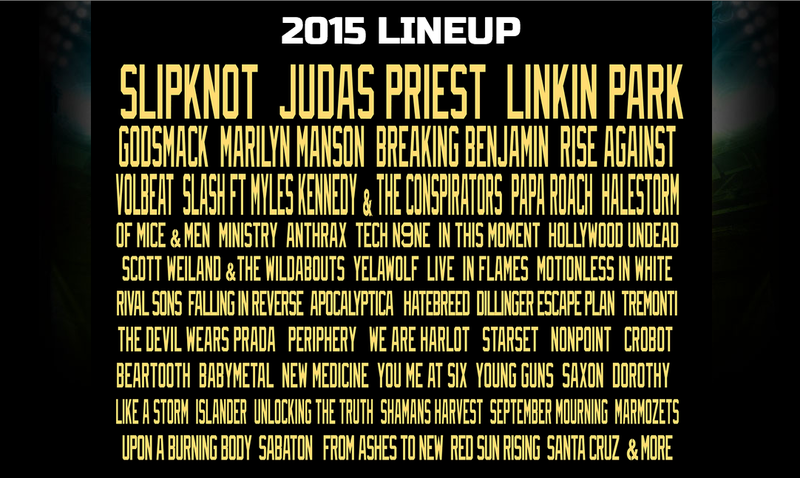 For more information on Rock on the Range, please check out the following: Website, Facebook, and Twitter.